Thank you to all the kind people that have contacted me about the blog. I feel missed which is nice. To be honest, I have always loved talking to all of you here so I am determined to get back to sharing thoughts and hearing yours as well. Instagram is great for instant satisfaction but in truth, words and ideas are more than just one simple photo so lets stay connected! First up is a follow up from the Denyse Schmidt workshops. Denyse joined us for a lecture and two days of working with her designs. It was, as I expected, a weekend full of thoughtful process. What I love about Denyse, (and in some ways this works with my curly hair/straight hair idea that we always want what we don't have!) is that she is so considered in what she does. There is a mental map, a design esthetic and a method to her quilts and process which she easily shared with us. The lecture revealed her path into quilting which didn't start in a sewing class but rather from the viewpoint that bedding was not being represented in the design world. 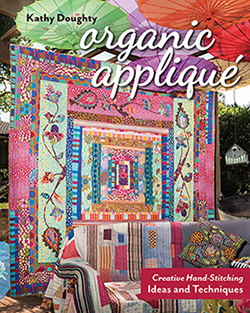 From that simple idea she started learning how to make design intensive quilts that would appeal outside the craft world and in that she succeeded. Here is my offering which is a combination of prints and plaids. I chose to do the Free Wheeling Single Girl project and was delighted with the choice. Working with paper templates is new for me but I found it to be easy and rewarding. I liked the balance of the active plaid prints as a background that allowed the lines of the quilt to show. It has a scrappy, old fashioned appeal. Further about this quilt is that it is the second quilt I have quilted on my Simply 16. Yes, I am branching into machine quilting. 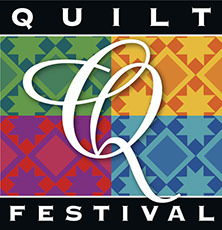 I simply have to make too many quilts for the shop to be able to do them all with my first love which is hand quilting. So, I splurged and got what I think is the perfect solution to my problem. Its a stand up machine with a frame that fits perfectly in my sewing room and allows me to finish my quilts! I tried hard to machine quilt on my Bernina but was never satisfied. Here I was able to free motion a design that allows my hand to show through without worrying about moving the quilt around all the time. It was just too messy. What I am liking is selecting a line from the fabric design to use for the quilting. I am finding that I like the line made from my hand whether or not it is perfect. Aside from doing workshops I have also taught lots of workshops this year. To be honest, I feel like I have hit my stride after suddenly learning exactly what it is that people want from me. It is a strange and wonderful experience to stand before a room of quilters with the intention of teaching them something they might not know. Color Works is a quilt from Mixing Quilt Elements that I have been teaching and it has been a blast. The idea is working with large scale prints and also how to work more traditional fabrics with contemporary designer fabrics. It is exciting to see everyone expanding their "individual comfort zones". The results have been outstanding and I have loved teaching it. You can try it at home with your stash if you have the book...go on, give it a try! There have been some fun product development items this year. Wendy Williams designed a series of small stitcheries Travel Threads that work independently or together as a whole. The alternating blocks are pieced and its a whole lot of fun. If you have never tried one of Wendy's patterns before, this is a fun take along project that could be fun for summer trips or holidays...thinking ahead. I mean really, why do we have spring except to plan for the summer time off!!! We just find there is no end to the fascination for Wendy's whimsy! The wool felt and Eleganza makes everyone happy. So the other day I did a Spring Fling with the fabric in the shop and rearranged all the fabric. This is something that I do regularly to organise my thoughts and the fabric at the same time. I love putting all the fabrics together in some sort of order. Firstly because it makes me crazy when they are complimenting each other in the bays but also because it is hard to work a shop when looking for something specific. So, I gathered up all the "basics" and sorted them by color. Amazing things happened. I realised that I do practice what I preach...Each color category has lights, mediums and darks which is important. Some better than others! For example, if you scan the blues you see a wide range of lights to darks and warms to cool tints. The greens are also good as are the purples. With the warmer colors there are more mediums and medium lights and hardly and darks!!! This is a great piece of information for me and for you! If the shop was my stash I'd immediately start looking for dark oranges, reds and yellows. As I type this I am thinking they are most likely on the other wall so I will dash in there today and fix it up!! This is a great exercise to do with your stash. In Making Quilts I have a quilt called Soul Searching that explores color in this way. 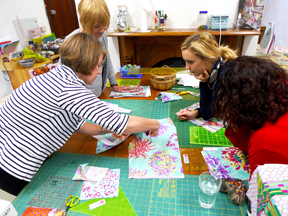 It is a fantastic learning experience for any quilter at any stage. Working through color groups considering value, tint and shade is the first step to making interesting quilts. I am always happy to talk about this concept so if you are looking to expand your comfort zone, just ask and we'll help you out! I know it is an area we must always search for growth. It gets easy to do the same thing over and over again. After all, we are human! Another time filler is our block of the month program. This year we put together a collection of favorites and got busy picking fabric and making samples. Karen Johns has been making our samples for Gelato Rose, a quilt design by Sue Cody that has always been popular. Karen is doing a beautiful job of putting these sample blocks together. Selections for the fabric comes from the best designers we have on the shelf and includes everyone from Anna Maria Horner to Kaffe Fassett...just for starters. I am proud of the work done in our shop. 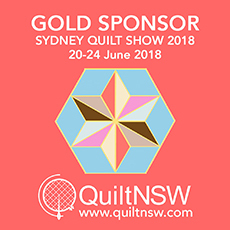 It is always with great pleasure that I find people from the shop featured in QuiltMania Magazine! Sue Cody, Kim Siviour, Megan Manwaring, Wendy Williams and even me all got a presence in the most recent issues. Teachers, students and staff all work hard to exercise our belief in how color works, how design flows, how techniques can be applied. We rejoice in the application of the creative spirit and love sharing what we know with you. Fantastic to hear an update!! It is so wonderful to once again find you here. Your beautiful way with words has been sorely missed. As always your post is delightful. Wondering if Noah was home to do his laundry? So happy to "hear" your voice again, Kathy. I have been checking at least weekly all summer in hopes of your return to the blog. Recently spoke with Anna Maria at a trunk show she did in Maine. She waxed on emotionally about her connection with you! Please continue to give us your musings as time allows.